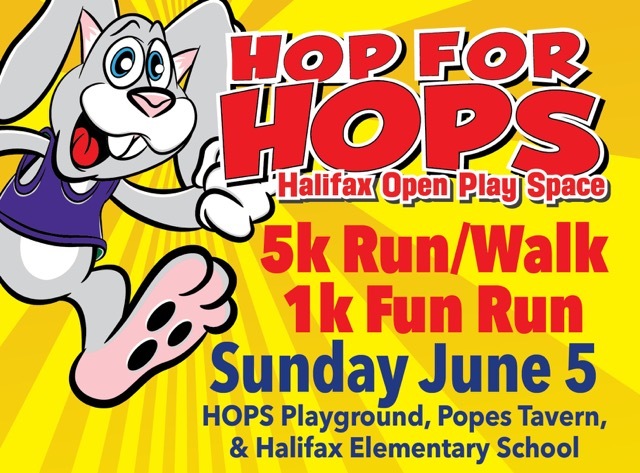 The 3rd annual Hop for HOPS 5K to benefit the rebuilding of our beloved town playground. Numbers will be available for pick-up Friday June 3rd from 4-7 and Sunday morning at 8AM until race time. Halifax Elementary School Gymnasium - 470 Plymouth Street, Halifax, MA 02338. A separate 1K "race" will be held at 11 AM at the lower track that circles the baseball fields. Children will be split into grade levels for their races. The entry fee is $10 and registration slips will go out to students in school through the PTO. All participants will receive a ribbon. Early registration is $25 and runs from now through Sunday May 15th. Each early registrant will receive a free "Hop for HOPS" tek running shirt. Starting Monday May 16th the cost of the race jumps to $30 and DOES NOT INCLUDE A SHIRT. Runners will be allowed to register the morning of the race.